Continue your Adventure in the 7th chapter of the World's Greatest Cities Mosaics series! 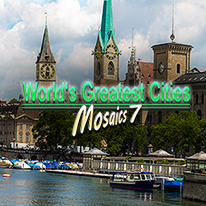 Contine your Mosaic World Adventure in this latest chapter of the World’s Greatest Cities Mosaics series and visit some more of the world's greatest cities as you play mosaic puzzles! Play 3 different types of mosaics and find out about greatest cities of the world.